Imagine you step outside and the blistering heat takes your breath away, seeps into your pores and feels like its sizzling your inner core. You try to find relief but heat has you surrounded and there’s no place to hide. Then imagine a cloud appears and gently releases large flakes of fluffy snow. They slowly float earthward and eventually touch your skin with dabs of cool that instantly evaporate. The relief is immediate and beautiful. Ya that’s not going to happen. But a guy can dream on a hot day. It seems like only a few weeks ago I was watching the snow gently fall on this elk. Snow makes everything more beautiful – especially these rocks! While I do enjoy the summer heat, there is something about the crisp cold ~ timely post. You’re just too easy going:) if you were fussy like me you would have to pick! Ha, ha ~ I enjoy rollercoaster rides very much. The highs and lows, and the falling and climbing in-between 🙂 Hard to choose! I like them in theory but my stomach says otherwise! Glad you enjoyed them. It was fun taking them. We have a wait for the snow, now at least we have the rains. It was so dry and hot! Your snowy critters are very beautiful. 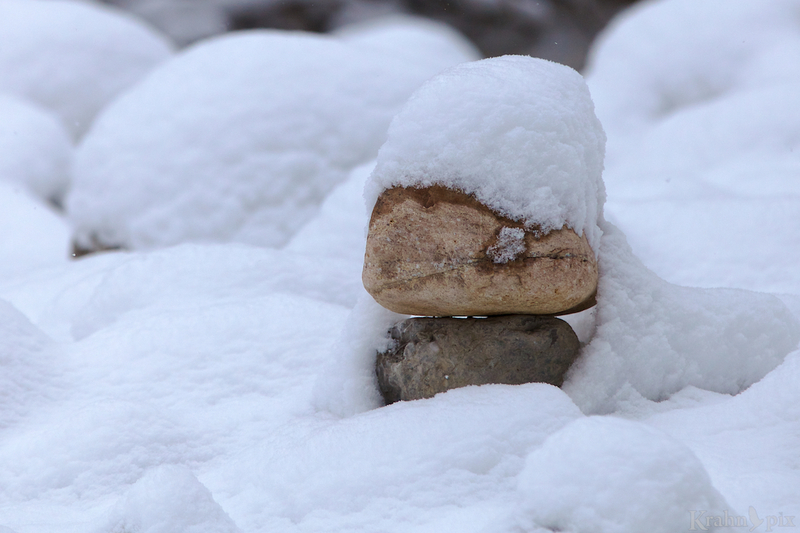 Even the rocks look great with a snow cap. It never ceases to amaze me how snow makes everything look better. I hope that helps. You have some mean, hot days! After a very hot run this morning here in TX, your snowy photos were just what I needed. We’ve already been up to 96. Ugh. That is crazy hot. I’d be really hoping for snow! With the temperature today scheduled to rise to 92 degrees F (33 C), your awesome photos are more than welcome. In fact, I may need to bookmark this posting, because summers in the Washington DC area are brutal in terms of both temperature and humidity. I particularly like the diversity of the shots that you presented. The images with the elks in the falling snow are amazing and I can imagine how difficult they were to capture, but my eyes keep coming back to the abstract beauty of that final shot and the pristine beauty of the freshly fallen snow. In different moods my preferences shift a bit, which is why I am happy you included all three of the images. While the heavy snow and elk shot is one I’ve been hoping to get for some time, it was the snow on the rocks that I kept coming back to so I had to include it. There’s something special about it and not just being there at the time and enjoying the surreal beauty. I feel the same as you that in different moods, I can often like different kinds of photos. All the best with that heat and humidity – that’s a nasty combination. 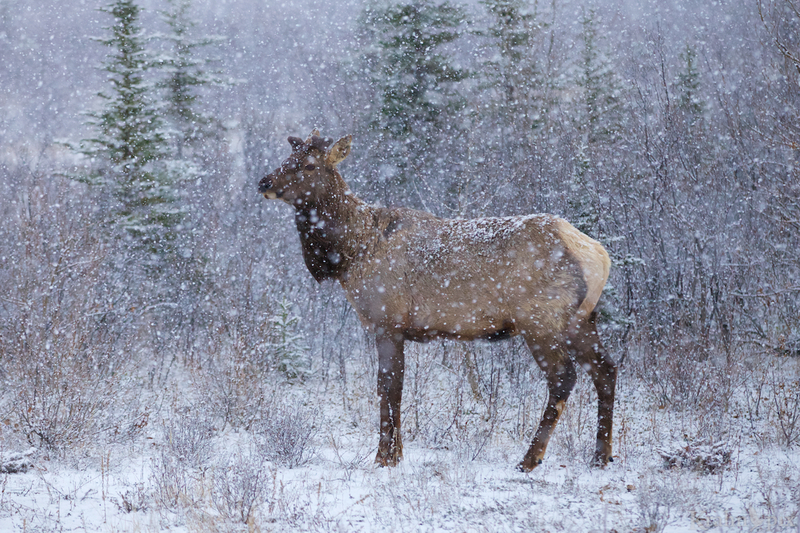 Lovely photo of the elk with the falling snow! And in the low 50s here in Scotland at the moment with bursts of rain and blustery wind but about 18 hours of daylight. I’m not a real fan of the blustery rain but that 18 hours is intriguing. I hope to experience that someday. 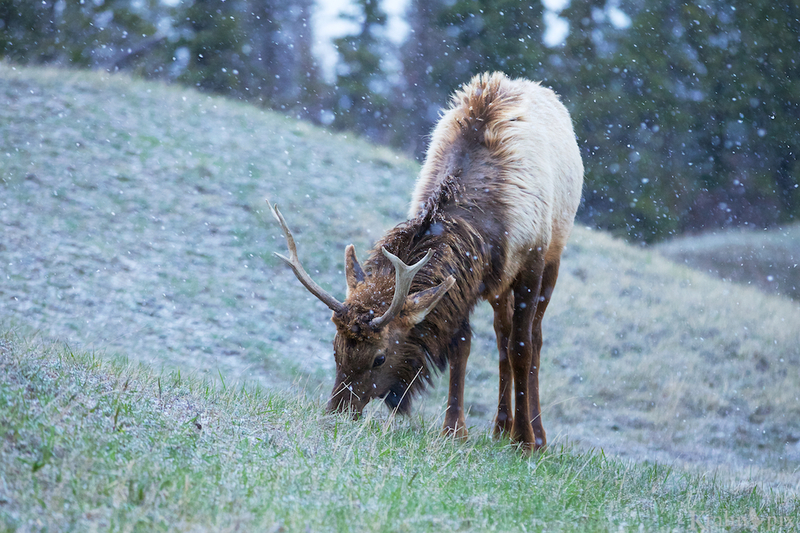 Lovely photos of the snow falling with the elk grassing. Looks so peaceful. And yes, a couple of days ago I was longing for the snow to come back! It was hot! It’s interesting how we often wish for a season we’re not in. I find the transitions between the seasons often the most enjoyable. We had 94F yesterday and 92F today, and I had to mow the lawn. I could have used a little of this! What a refreshing (and beautiful) set of photos! A visual peppermint! I can feel the snowy cold and that image in my mind is comforting as we go into summer drought season. It was 88 here yesterday. A front came through and dropped the temperature a bit so today was much more pleasant. That’s hot and facing a summer drought is not encouraging. All the best with that. I like the way you play with words – visual peppermint.” Thank you. We have had a nice run of moderate temperatures for a few weeks now after some very warm early spring days. That’s all going away for the next couple as the 80s and possibly 90s are on their way. But the humidity is really the bad guy. I work in a warehouse with a concrete floor and sometimes the humidity is bad enough that the floor has a layer of moisture that causes the furniture boxes to stick and we can’t slide them. Oh boy that sounds hot! I hope the forecast is wrong for your sake. I have experienced humidity at times and it adds a whole new dimension. I hope the memories of snow help! It has been a while since we saw moisture so any form is looking good. These photos were something I was hoping to get for some time. Just another reminder how beautiful snow can be. Glad you enjoy them. The plan is for me to keep posting – we’ll see how that goes. Happy to hear someone else sees the benefits and beauty of snow and ice. Thanks for commenting. Not a fan of either extreme, hot or cold. Seems as though this coastal region is tilting more and more toward the warmer spectrum I don’t appreciate. Snow is such a rare occasion around here, it’s something to be celebrated. I wouldn’t mind a bit more, but your images did give me a taste. Nice. I thot your area would be more temperate. Too bad about the warming trend. Our weather is all over the place so we get the extremes and some gorgeous days in the middle. I think all places have their weather down sides. I still celebrate a fresh snow fall but it seems everyone around me isn’t too keen. I’m in the humid South in East Tennessee, and don’t use an air conditioner at home. It can be uncomfortable, but my electric bill comes in hundreds of dollars less, and then I feel like I’m getting paid to sweat! Love love love your photos! Glad you enjoyed the photos. My heat aversion makes me much more willing to pay but I admire your stamina! All three – very nice. Glad you liked them. I’ve been hoping for sometime to get the nice flakes in the air and the opportunity was there a couple of months ago. HA! Toasty where you are is it? I’m not much of a fan of heat and it’s been up to 88 F already here.